It’s captain poll time for Round 24! Don’t forget, the transfer deadline is, Wednesday the 16th at 7:30pm EST so be sure to get all of your trades in and captain set by then. There are several good captain options for this round, have you decided on yours yet? To help you, check out to top options from the MLSFB and MLSFI crew below. 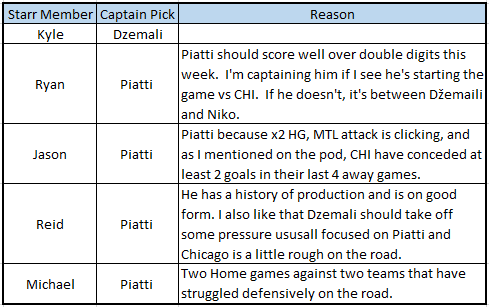 Also, find out what the community thinks and join the discussion at r/FantasyMLS and vote in the Round 4 Captain poll.